CHATTANOOGA, Tenn. — (March 20, 2019) With the boom of motorhome sales comes the demand for convenient and secure RV storage and overnight parking. Local industry leaders, John and Karen Hawkins will open a $3 million luxury RV park, Hawkins Pointe, this summer. With the boom of motorhome sales comes the demand for convenient and secure recreational vehicle (RV) storage and overnight parking. Local industry leaders, John and Karen Hawkins, will open a luxury RV park, Hawkins Pointe, this summer. Chattanooga, North Georgia and the surrounding region is fast becoming a premier destination point for RV owners. According to a study published by the RV Industry Association in 2016, $254.6 million has poured into Tennessee and Georgia just from RV campgrounds and travel. 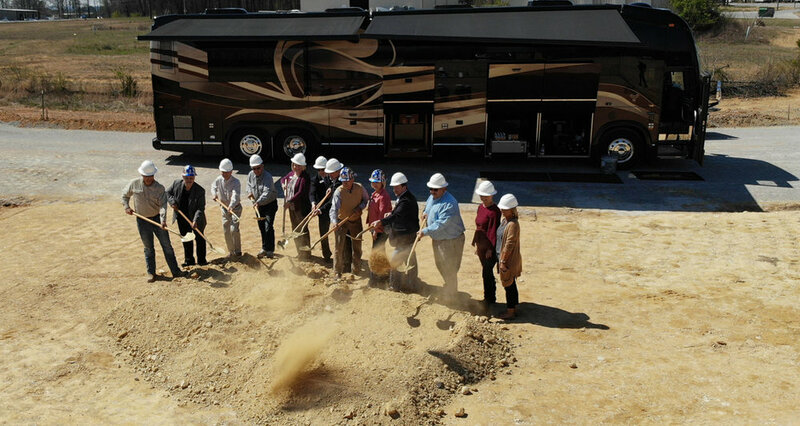 Located at Emerson Circle, just off Exit 1, Hawkins Pointe broke ground March 20 on the 6.4-acre site, which will include multiple storage solutions as well as a campground and overnight parking. Hawkins Pointe will meet the demand for premier RV services at its convenient location, close to I-75, Cabela’s and Bass Pro Shops. Long-term parking solutions include 34,000 square feet of covered storage and 14,000 square feet of luxury climate controlled indoor storage, the only building of its kind in the southeast. The luxury space will include bathrooms, showers and laundry facilities as well as patio space, large screen televisions, outdoor kitchen and bar. Spaces in this building are very limited and can be reserved at hawkinspointe.com. Overnight facilities will include 54 outdoor pull-through parking spots, two fenced dog parks, two pump-out stations and two wash stations. The storage facility is slated to open in the summer of 2019. Camping facilities will launch later in the year. Those interested in reserving parking spots can visit hawkinspointe.com and request to be placed on the reservation list.